Maineâ€™s largest metropolitan area sits right on the beautiful Casco Bay, a gateway to historic forts and lighthouses. Cyclists can expect a visit filled with scenic beauty, recreational opportunities and a wealth of historic, culinary and cultural attractions. Many people think of Freeport, Maine, as a shopping mecca. The anchor store was opened in 1912 by Leon Leonwood Bean, creator of the famous Maine Hunting Shoe. The 9-mile loop takes you out to Wolfe’s Neck Woods State Park where you can see the rocky coast. The 16-mile loop explores the back roads in the Freeport area and goes by the Maine Audubon Mast Landing Sanctuary. The scenic 22-mile+ and 30-mile+ rides have three different starting points and then take similar routes, offering a quintessential view of coastal Maine. Portland has a working waterfront and a picturesque shopping district. In the 18th and 19th centuries, this was once a busy shipping port. From Portland, cyclists cross over the Fore River on the Casco Bay Bridge and head out toward the coast with opportunities to stop along the way at state and municipal parks with lovely sand beaches, historic lighthouses, and two interesting lighthouse museums. The 30-mile+ ride takes you to Prouts Neck, where artist Winslow Homer lived and painted. The Eastern Trail is both a trail and a vision. The existing Eastern Trail is a combination of off-road trails and scenic quiet country roads with the vision to become an entirely off-road trail in the future. This pleasant 35-mile ride takes cyclists from Portland’s historic waterfront to nearby suburban towns, including Falmouth, Yarmouth, Freeport and Brunswick, and the quiet countryside along Maine’s coastline. Among other attractions, the coastline offers gorgeous views of Maine’s rocky coast, a bird sanctuary, seaside camps and Wolfe’s Neck Woods State Park. Two of Adventure Cycling’s bike routes traverse Maine, including the Atlantic Coast Route and the Northern Tier Route. Adventure Cycling’s Atlantic Coast route begins in Bar Harbor, Maine and continues south along the Atlantic coast for 2,670 miles through 12 other states, eventually ending in Key West, Florida. 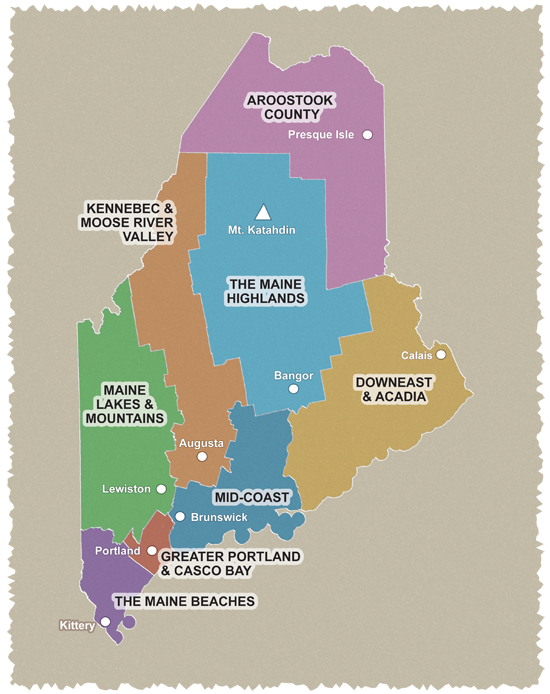 In Maine, the Atlantic Coast route begins in Bar Harbor and makes its way 250 miles down the coast to Kittery before entering New Hampshire.